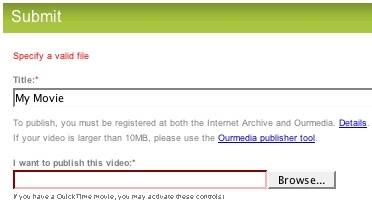 I’m a big supporter of Ourmedia, but the past few videos I’ve tried to upload there have failed. I’ve even tried multiple times to do uploads, and I either just get a blank page after upload or an error message. I’m not doing anything different in how I create videos, and my browser setup should not have changed, so I don’t know what is up. I’m sure I’ll try again, especially with audio, but for now I’m putting my video on blip.tv. Most of the videobloggers have plenty of good things to say about blip.tv. They’re a company that gets it when it comes to videoblogging, and Mike Hudack from blip.tv takes part in the conversation with videobloggers which, I think, goes a long way towards earning their praise. Keep up the good work blip.tv! Posted on Tuesday, July 18th, 2006 at 6:00 am. Subscribe to the comments feed. Both comments and pings are currently closed. Post on your own blog.